Wave washers get their name because of their wave shape. This distinctive shape produces spring pressure when the wave washer is somewhat compressed. Wave spring washers are suitable for a variety of bearing applications where a small deflection may be required. 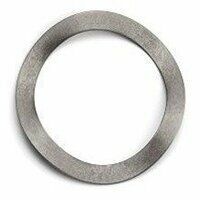 It is particularly common to use wave washers to take up end play and for the loading of bearing assemblies. You can search through our range using a number of filters, including inside diameter, outside diameter, thickness, free height and loaded height. If you buy online, you can take advantage of not just great prices, but also fast delivery.